Russian President Vladimir Putin has said he wants to make Germany a gas hub for Europe, following talks with Chancellor Angela Merkel. Energy supplies were high on the agenda at talks in Dresden, as the two leaders met for the sixth time this year. Mr Putin said 50 to 55 billion cubic metres of natural gas supplies from the Barents Sea could be redirected to Germany. Up to 40 billion cubic metres of gas are currently sent each year. Russian energy giant Gazprom announced Monday it would develop the vast Shtokman gas field for the European market, reorienting the project away from the United States. 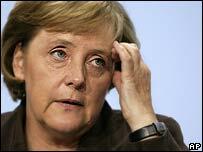 The talks come as Germany prepares to take over the presidency of the G8 group of industrialised nations. Germany is Moscow's main trading partner in the EU and during its presidency of the G8 it will have a leading role in shaping Western policy towards Russia. A number of opposition MPs in Germany have been calling on the German government to be more forceful in its criticism of the Kremlin on human rights issues. Russia is accused of flexing its muscles over former Soviet neighbours, such as Georgia. They also point to the recent murder in Moscow of investigative journalist Anna Politkovskaya as a sign of the dangers faced by independent media under President Putin. At a press conference after the meeting, Mr Putin described the crime as "appalling in its cruelty" but also remarked that her "capacity to influence political life in Russia was extremely insignificant". Mrs Merkel has raised public concern in the past about the state of Russian democracy - far more than her predecessor Gerhard Schroeder ever did. But the BBC's correspondent in Germany, Steve Rosenberg, said she had shown no sign of letting human rights issues "cloud the special relationship" between the two countries. In earlier meetings with Mrs Merkel and French President Jacques Chirac, Mr Putin has sought to reassure France and Germany about the security of Europe's energy supplies. Concerns were raised at the beginning of the year when Russia temporarily cut supplies to some European customers during a row with Ukraine over prices.